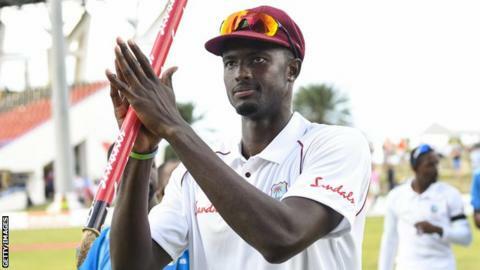 West Indies captain Jason Holder will miss the final Test against England after being banned by the International Cricket Council. The all-rounder, 27, will serve a one-match suspension for his side’s slow over-rate in the 10-wicket win in the second Test in Antigua. The third Test in St Lucia starts on Saturday, with West Indies 2-0 up in the series. Holder is the leading run-scorer with 229 at an average of 114.50. He has been a central figure in West Indies securing a first series win over England since 2009, and their first over any side other than Bangladesh and Zimbabwe since 2012. Holder was named man of the match after making an unbeaten 202 and taking two wickets in the 381-run win in the first Test, a performance which took him to the top of the ICC rankings for Test all-rounders. Holder claimed 4-32 to help bowl England out for 132 in Antigua on Saturday before West Indies sealed victory with two days to spare. He missed the second Test in New Zealand in December 2017 after being banned for a slow over-rate offence. There will be people who look at this and say it’s petty, that it’s a great shame that Jason Holder can’t arrive in St Lucia with his team 2-0 up and try and beat England again. But the fact is the West Indies over-rate in the Antigua Test match was very slow indeed. If they let Holder off this time and set some sort of precedent, what happens the next time the ICC tries to punish a captain?